It was a wonderful new day in the Everfree Forest. How could it not be when one was so gorgeous?, thought the serpent Steven Magnet, rising from beneath the gently burbling river to look at the world above. The wind was coming from the direction of the pony village, carrying scents of apples and baking, and Steven just thought he could make out a blue dot in the sky keeping the few clouds in the sky from passing above it. The parasprites were buzzing merrily above, at least until an incautious swarm was licked out of the air by the long sticky tongue of a sprite-eater, while the distant crash of falling trees suggested the Ursa Minor was out to play again. He looked down at the river, its calm surface mirroring back his impeccable purple scales, marvellously styled orange mane and luxurious moustache. Ripples from downstream warped Steven’s reflection, interrupting his reverie. A shoal of fish were swimming hurriedly in his direction, prompting Steven to duck his head back under the water. The fish swum on, ignoring Steven, save for the smallest. Turning briefly from the back of the shoal, she called, “It’s awful! Get away!” She immediately flicked her fins and turned back, racing to catch up with the others. “But if not me, then what? Whatever it is, it must be double-plus-unfabulous to distract any creature from me!” It simply would not do for anything to be shooing away his potential fans. Checking his visage once more in the now-becalmed river, he gave himself a thorough nod of approval before heading down river, towards the source of the unfabulosity. The closer Steven Magnet swam to the mouth of the river, the less fabulous it became. Splatters of ink marred the previously-pristine river bed, reeds lay broken, and tangles of seaweed wrapped around the remaining foliage. More than once, one of Steven’s arms caught on the disgusting tangles, and he had to pause to carefully extricate himself while minimising contact with its slimy surface, his distaste fully evident. Hermit crabs’ shells lay smashed on the gravel, while carefully constructed nests were trashed and tarnished. Almost none of the river’s residents remained here; most either passed Steven wordlessly, swimming upriver, or cowered behind rocks, afraid to show themselves. “Yeah,” replied the first shark. “Uh, yeah, I guess so!” agreed the second, after a few moments’ thought. “So, you’ll be a good serpent and flip off, won’t you?” concluded the squid, extending a tentacle menacingly towards Steven, who recoiled in disgust. The two sharks again descended into sniggering as the three swam upriver, leaving Steven trapped in the seaweed. Tossing and flailing his coils, Steven turned the river into a tumultuous froth, but the clinging seaweed was not dislodged; the squid clearly knew his knots. Nor could Steven untangle himself with his hands, bound uselessly as they were against his body. “Oh, somebody, anybody! Help me!” he cried, tossing his head in anguish, but there were no creatures around to hear, the few who remained having fled from the terrorising trio. Eventually, having exhausted himself struggling, Steven lay down on the river bed, defeated. “Oh, my hair, my beautiful hair...” He stared blankly at the bank, until a metallic glint caught his eye. It was half-buried in the silt underneath a rocky ledge, and seemed to be some kind of knife – perhaps dropped by somepony, and washed down the river? The waterlogged remains of a parcel lay around it; a delivery gone wrong, maybe. However it had come to be there, the fabulous serpent saw in it his means of escape. As he concentrated, Steven’s extravagant moustache begun to twitch, while the knife started to vibrate slightly. 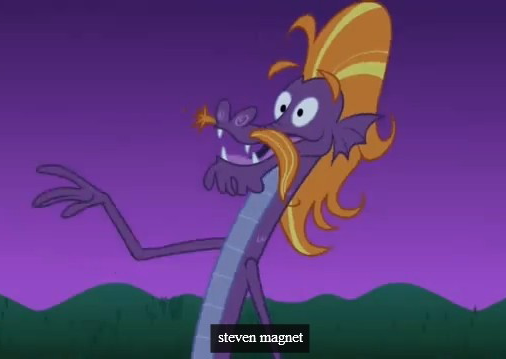 For Steven Magnet was more than a name: his moustache, if he willed it enough, could become powerfully magnetic. This was not typically helpful to a serpent, he acknowledged, but it occasionally came in useful for holding his styling equipment, which might otherwise become washed down river, or for acquiring half-buried baubles without getting his claws dirty. He closed his eyes tight, focusing on the task at hand. “Go... go... magnet... moustache...” he mumbled, moustache tingling as the knife was gradually drawn out of the mire. With a metallic scraping sound, it suddenly arced through the water, slicing through the seaweed bindings. Steven ducked to protect his mane from further damage, and quickly cast off the slimy tendrils. Steven swam down river once again, his marvellous coiffure almost returned to its former glory following some emergency maintenance. This time, however, he was accompanied by the fish he had met earlier, carrying a large basket between them. He shuddered at the chaos the invading sea creatures had made of his river, but, steeling himself, continued on to its mouth. With a motion of his arm, Steven sent in the fish, which dropped the basket and pulled out several long ribbons festooned with bows and bells, each supported by several fish. The serpent himself withdrew three extravagant wigs. The sharks each swam after one of the fish, knocking them away, but they were greatly outnumbered by two dozen fish carrying extravagant ribbons, and their efforts only succeeded in delaying their inevitable entanglement. Scars and Skulls were soon draped with fancy garlands, tying them to each others’ backs, while the fish easily evaded the bound thugs. As the ink cleared, Steven prettified the sharks with his other two wigs, despite their snarling within their bonds. The tough trio certainly looked more fabulous like this, he thought; admittedly, not in his league, but he could hardly blame them for their inability to attain such perfection. Steven and the fish turned and left, leaving the trio fuming, be-wigged and festooned in gaily decorated bunting. It was another wonderful new day, and Steven Magnet was once again enjoying the bright sunshine glinting off his iridescent scales and accenting his mane, now fully re-styled and entirely fabulous. As he swum under the bridge nearest to where the river passed near Ponyville, he once again saw the orange, winged filly looking out for him. Steven tossed his mane and smiled winsomely. Yes, he truly was magnetic, and in more than one way at that.